Tropical cyclones can wreak havoc on coastal infrastructure, marine habitats and coastal populations. However, Dr. Michael Cuttler, from the ARC Centre of Excellence for Coral Reef Studies (Coral CoE) at The University of Western Australia, said a fringing reef can protect the beach from extensive erosion during cyclones. Dr. Cuttler and several of his Coral CoE colleagues studied Ningaloo Reef—Australia's largest fringing reef system, and a UN World Heritage site—during Tropical Cyclone Olwyn in 2015. Olwyn was a Category 3 severe tropical cyclone that caused extensive damage along the coast of Western Australia. The team observed that the shoreline remained largely unscathed because of the protection of its offshore reef. "The large waves generated by the cyclone were effectively dissipated by the reef situated offshore," Dr. Cuttler said. The shape, or geomorphology, of the reef—with its steep forereef slope, shallow reef crest and reef flat, and relatively shallow lagoon—is representative of most fringing reefs worldwide. 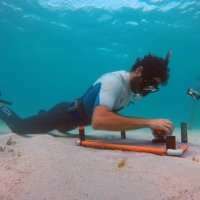 While the findings of Dr. Cuttler's study indicated that coral reefs can effectively protect coastlines from tropical cyclones and other large wave impacts, it also suggested that for reef systems with lagoons, local wind effects could not be ignored when attempting to model or predict the impact of cyclones. He also warned that the ability of reefs to protect adjacent coastlines was threatened by both sea level rise and slowing rates of reef accretion. Dr. Cuttler and his Coral CoE colleagues found the results could be used to assess coastal hazards facing reef-fringed coastlines due to extreme tropical cyclone conditions, and wiould become increasingly relevant as climate change altered the status of coral reefs globally. The paper "Response of a fringing reef coastline to the direct impact of a tropical cyclone" is published in the journal Limnology and Oceanography Letters.